The HSM Securio B24s Strip-cut Shredder is ideal for small businesses. Capable of shredding up to 28-30 sheets of paper, can create 38 strip-cut particles per page, has a 9-gallon capacity of waste bin and an inspection window to monitor filling level. 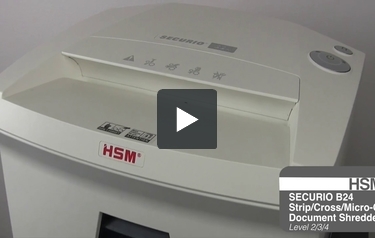 The HSM Securio B24s is perfect for shredding of tax documents, bank statements, and medical bills. It can also shreds staples, paper clips, credit/store cards and CDs/DVDs. This shredder has a JamStop Anti-Jam Technology feature that prevents jams when machine is overloaded and can work continuously with no down time. If you are looking for an affordable yet perfectly engineered strip-cut shredder, then HSM Securio B24s Strip-cut Shredder is the best for you.